As temperatures continue to climb, more and more cyclists will begin to pop up on the bike lane-lined streets of Philadelphia. Biking, however, doesn’t come without a unique set of dangers. In fact, a number of people have lost their life riding a bicycle in this city. Commuter cyclists are accustomed to these dangers and have likely experienced a number of close-calls, falls and other non-life threatening injuries, including concussions. Head injuries are among the most common cycling-related injuries and are almost always involved in cycling fatalities The Royal Society for the Prevention of Accidents reported in 2017 that more than 40 percent of cycling injuries that resulted in a hospital visit involved a head injury. Helmets seek to disperse two types of energy forces at play in brain injuries and concussions. When your head is hit head-on, the damaging force is linear energy. The other type, rotational energy, results when the head takes impact at an angle, and results in the worst concussions. A new cycling helmet by Trek is designed to absorb that rotational energy, Popular Science reports. When a person falls off their bike, it’s common for their head to pivot and turn, resulting in a rotational-style concussion. It's among the most dangerous injuries because cerebrospinal fluid (the brain’s natural protection as it were) moves around, allowing your brain to shift in your skull, leading to damage of its fragile nerves, Popular Science explains. 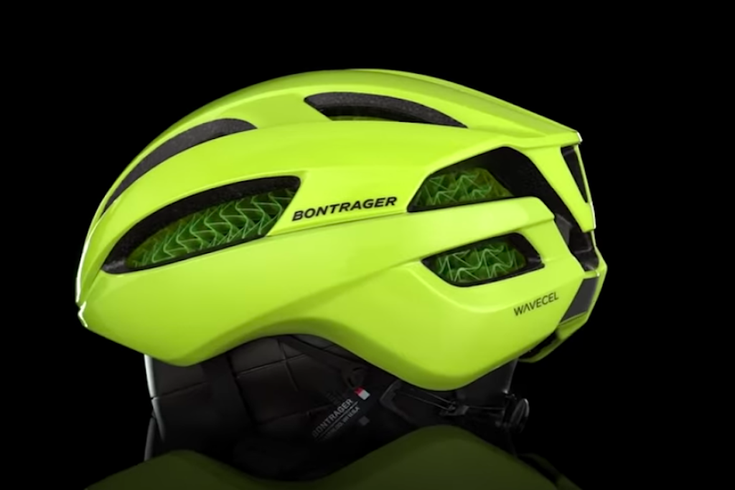 The WaveCel helmet uses a collapsible cellular material that’s incredibly effective at preventing concussions caused by common cycling accidents. It works by going through a three-step change in material structure on impact to absorb energy before it reaches your head, according to Trek. In fact, a study conducted to ensure the efficacy of these helmets was recently published in the journal Accident Analysis and Prevention. It found that with near 100 percent effectiveness, WaveCel can help prevent concussions. Forbes notes that Trek estimates WaveCel helmets weigh about 53 grams more than a basic one. But airflow and heat transfer are good because of all the air contained in the collapsible material. These WaveCel helmets don’t come cheap: road versions range from $149.99 to $299, a mountain version costs $299 and a commuter version is priced at $149. Those prices may seem expensive with Amazon offering a range of choices for $20 or less. But, as Forbes put it: “If you’ve got a $20 head, wear a $20 helmet.” Shop Trek's WaveCel helmets here.